Hpa-an (Phlone ဍုံထ်ုအင်; S'gaw Karen: ဖးအါ, Burmese: ဘားအံမြို့, pronounced [pʰə ʔàɴ mjo̰] also spelled Pa-an) is the capital and largest city of Kayin State (Karen State), Myanmar (Burma). The population of Hpa-an as of the 2014 census was 421,575. Most of the people in Hpa-an are of the Karen ethnic group. Hpa-An has a tropical monsoon climate (Köppen climate classification Am). Temperatures are very warm throughout the year, although maximum temperatures are somewhat depressed in the monsoon season due to heavy cloud and rain. There is a winter dry season (November–April) and a summer wet season (May–October). Torrential rain falls from June to August, with over 1,100 millimetres (43 in) falling in August alone. 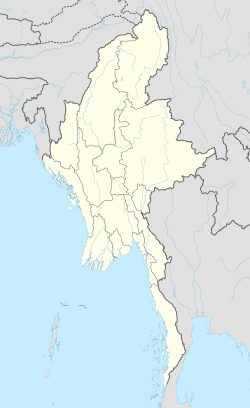 Hpa-An is linked to Yangon, Mawlamyine and Hpapun by air. There are express buses from Hpa-An to Yangon, Mawlamyine, the border crossing at Myawaddy and other towns. The majority of residents are Theravada Buddhists, followed by Baptist, Anglican and Roman Catholic Christians. Zwegabin United FC founded in 2010, is based in Hpa-An. The club is competing in Myanmar National League. Mount Zwegabin is around 8.5km south of Hpa An. It is famous among tourists for its stunning view and beautiful green nature. ^ "Myanmar Area Codes". Retrieved 2009-04-10. ^ "The Ultimate Backpacking Experience". 2016-08-21. Retrieved 2018-05-30.